Background: Calmodulin (CaM) is a ubiquitous, calcium-binding protein that can bind to and regulate a multitude of different protein targets, thereby affecting many different cellular functions. Binding ofsmall, hydrophobic molecules alter its function, as in the case of Phenothiazine (PTZ). PTZ isan organic compound with a history of use as an antihelminth and frequently quoted as a classic example of a pharmaceutical lead structure.Its derivatives are currently used as antipsychotic drugs. Triflouperazine (TFP) is a phenothiazine derivative and a dopamine antagonist, with antiemetic and antipsychotic activities. TFP exerts its antipsychotic effect by blocking central dopamine receptors, thereby preventing effects like delusions and hallucinations caused by an excess of dopamine. This agent also functions as a calmodulin inhibitor, thereby leading to an elevation of cytosolic calcium. We have attempted to screen the extent of CaM specificity towards different classes of TFP and PTZ. Methods: Molecular docking approach using the Lamarckian Genetic Algorithm was used to elucidate the basis of structural similarity of TFP and PTZ with CaM. In total, 3000 compounds were studied. All of the antagonists were taken from PubChem database on the basis of the structural similarity of TFP and PTZ. Results: The docking result of these molecules with CaM demonstrated favored binding energies in the range of -11.50 kcal/mol to -4.51 kcal/mol, with 8 molecules showing hydrogen bonds with the active site residue Met124. 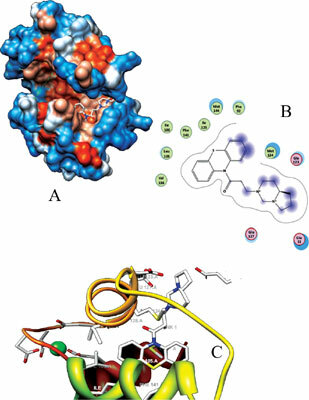 Compound 1 was found to be the best CaM inhibitor. The Drug like and chemical toxicity was also predicted for this compound. Conclusion: Computational docking is a feasible method to screen inhibitor compounds against a biomolecule of interest. Keywords: Calmodulin, virtual screening, molecular docking, trifluoperazine, phenothiazine, PTZ. Keywords:Calmodulin, virtual screening, molecular docking, trifluoperazine, phenothiazine, PTZ. Abstract:Background: Calmodulin (CaM) is a ubiquitous, calcium-binding protein that can bind to and regulate a multitude of different protein targets, thereby affecting many different cellular functions. Binding ofsmall, hydrophobic molecules alter its function, as in the case of Phenothiazine (PTZ). PTZ isan organic compound with a history of use as an antihelminth and frequently quoted as a classic example of a pharmaceutical lead structure.Its derivatives are currently used as antipsychotic drugs. Triflouperazine (TFP) is a phenothiazine derivative and a dopamine antagonist, with antiemetic and antipsychotic activities. TFP exerts its antipsychotic effect by blocking central dopamine receptors, thereby preventing effects like delusions and hallucinations caused by an excess of dopamine. This agent also functions as a calmodulin inhibitor, thereby leading to an elevation of cytosolic calcium. We have attempted to screen the extent of CaM specificity towards different classes of TFP and PTZ.